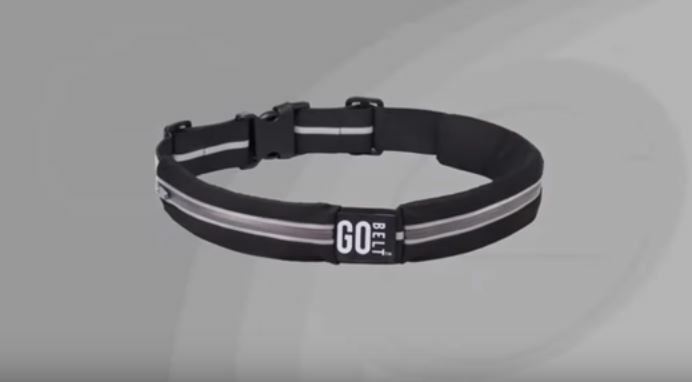 Go Belt is a fine sports belt which should appease those who don't want to use a fanny pack, but would prefer not to carry a wallet or keys in their pockets. There are a number of similar belts that can be found online and locally that don't come with the obligatory "double offer" and should be considered before making your final decision. Go Belt is an accessory which holds a variety of items around the user’s waist. Go Belt is currently available online only on the official website (getgobelt.com) for $10 plus $4.95 shipping. Look carefully at the order page, as there is a “double offer” which you cannot opt out of that adds a second belt for another $4.95 shipping. Two “Go Wallets” are also included with every order. The entire cost of your order will be $19.90 ($10+$4.95+$4.95). The domain ordergobelt.com has also been used, although the current advertisements point to getgobelt.com. There is a 30-day money back guarantee, although the $9.90 in shipping costs is not refundable. Below is a transcript for the television commercial that ran for Go Belt (note that this older version of the commercial listed a price of $14.95, which is no longer accurate. It also includes “Go Tunes” which was replaced by “Go Wallet”). Tired of hauling around a big heavy handbag or having your pockets full all the time, only to end up with another cracked screen and who even has pockets anymore? Now there’s the Go Belt, the stretchable belt that holds everything. Finally grab-and-go convenience meets safety and security. Go Belt is extra stretchy, moves with you, and gives you easy access to the things you need when you need them. Go Belt fits around your waist, so you can enjoy a hands-free workout anytime, and its reflective tape provides added visibility at night. Its zippered pouches expand to hold dozens of essentials and its discreet design stays safely hidden out of sight. It features two expandable pockets. One for smaller items like keys, cards, and cash, and a larger one for your smartphone, passport, or anything you want to keep secure and hidden under your clothes. It even fits those oversized smartphones. Look at that! Take Go Belt with you when traveling. Get through security in a flash with Go Belt. Its grab-and-go convenience is great for for busy parents and older kids. It goes with you anywhere and everywhere. Anything that requires two hands just got a whole lot easier with the Go Belt, and just look at how much it holds. Amazing. Similar products sell for almost $30, but you can call or go online now and get hands-free with Go Belt for only $14.95. But wait, call right now and you can also get Go Tunes, the perfect tangle-free companion to your Go Belt guaranteed to deliver crystal-clear sound and never tangle. A $20 value yours free. Just pay seperate processing. That means you get the Go Belt and Go Tunes, a $50 value all for only $14.95. Here’s how to order. Go Belt (also stylistically written as “GoBelt”) is an expandable belt which can be worn underneath or over clothing. It works similarly to an old-school fanny pack, although it comes with some significant improvements. Whereas a fanny pack retains the same shape regardless of how much is stored inside, Go Belt sports a sleek design and only expands to the size of whatever is inside. Its stretchy material expands and contracts depending on what is being held within. There are two pockets which are slightly different sizes, allowing you to put smaller items into the smaller pocket, which help Go Belt maintain a compact size. The larger pocket is said to be ideal for items such as smartphones and passports, while the smaller pocket is better for items such as keys or credit cards. Each pocket has its own zipper, which will keep items safely tucked away. The belt can fit waist sizes ranging from 24 to 50 inches, which should be sufficient for the majority of consumers. Our product researchers feel that Go Belt will be rated around 3 to 3.5 stars by consumers who receive and use the product. We predict there will be a number of reviewers who are dissatisfied purely by the shipping costs and delays, which will negatively affect the overall star rating of Go Belt. This is quite common for new products which are not available in stores. A word about the double offer… You are obligated to purchase two belts, and you can only pick two black/gray or two black/blue (meaning you can’t pick one of each color). Because you are obligated to purchase two belts, you will be paying shipping for both, amounting to $9.90, which is not refundable. When Go Belt appears in stores, we estimate that it will probably cost about $10. Go Belt is brought to you by Idea Village, a popular As Seen on TV marketing company. Although Idea Village currently has no rating with the Better Business Bureau as of this writing, there is a BBB entry, which includes a list of complaints, which tend to revolve around problems with the product or advertising issues. There are a number of sports belts which sport similar designs to that of Go Belt. Popular offerings on Amazon include FlipBelt, the Woogwin Sports Running Waist Pack, or the MoKo Waist Bag. A wide variety of sports belts can be found on Amazon. There is, of course, the classic fanny pack, although that does not appear to be the first choice of most consumers. Go Belt is a fine sports belt which should appease those who don’t want to use a fanny pack, but would prefer not to carry a wallet or keys in their pockets. There are a number of similar belts that can be found online and locally that don’t come with the obligatory “double offer” and should be considered before making your final decision. Have you tried Go Belt? Please give it a star rating and comment below.